As record numbers of women are populating the new U. S. Congress and women’s rights continue to be part of the national dialogue, the Lockwood-Mathews Mansion Museum will celebrate the centennial of the 19th Amendment to the Constitution with the exhibition, From Corsets to Suffrage: Victorian Women Trailblazers, May 16-Nov. 3, 2019, 12-4 p.m. Opening Reception on May 16, 5:30-7:30 p.m., $5 for members; $10 for non-members. American women’s right to vote was a milestone in the ongoing effort to guarantee women’s full and equal protection under law, participation in civic and community life, and social equity. 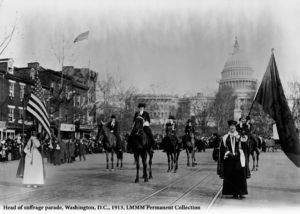 The suffrage movement of the 19th and early 20th centuries shaped the 1960s Civil Rights Movement and continues to echo in today’s every-day life as well as media and celebrity activism. The exhibition, From Corsets to Suffrage will show local, regional, and national efforts featuring rare images and objects, memorabilia, and period costumes that will illustrate the activities and contributions of women and men across the state and the country. This exploration will also highlight women of national renown, who are part of the Mansion’s history, such as author and Titanic survivor Helen Churchill Candee, an active participant in the Washington D.C. suffrage parade, and Elsie Hill, who aided Alice Paul’s National Woman’s Party and locally, the Connecticut Woman Suffrage Association on its 1912 multi-week trolley tour, carrying pennants and banners proclaiming, “Votes for Women.” Also highlighted are Norwalk advocate Alyse Gregory, who managed the 1913 Connecticut tour of the British play “How the Vote Was Won,” and the eldest daughters of U.S. Congressman Ebenezer Hill, Clara and Helena; the latter was arrested four times for picketing the White House, once for carrying the banner, “Governments derive their just powers from the consent of the governed,” to name a few. The exhibition was made possible with loans from the following museums and foundations: Bruce Museum, Fairfield Museum and History Center, Stamford Historical Society, Litchfield Historical Society, Norwalk History Room, Rose O’Neill Foundation, Springfield, MO, Bonniebrook Gallery, Museum and Homestead, Walnut Shade, MO, and the following private collections: Lisa Wilson Grant, Rowayton, CT, Wendell Livingston, Rowayton, CT, Rosemary Gillham, England, Bridget Thorne, Armonk, NY, Kenneth Florey, Madison, CT, Gil Rodriquez, Darien, CT and Susan K. Scott, Branson, MO. The Museum’s 2019 cultural and educational programs are made possible in part by generous funding from LMMM’s Founding Patrons: The Estate of Mrs. Cynthia Clark Brown, LMMM’s 2019 Season Distinguished Benefactors: The City of Norwalk and The Maurice Goodman Foundation. Hours and Admission: Please visit website.